"Ghosts," a play by Norwegian writer Henrik Ibsen, portrays a woman named Helen Alving who is caught in the snares of social convention. Married to an evil man, Helen wavers between living truthfully and preserving her husband's public reputation. In this scene, Helen has just confessed her troubles to her minister Pastor Manders when her son unexpectedly arrives. They immediately take on sprightly expressions and begin chatting superficially. 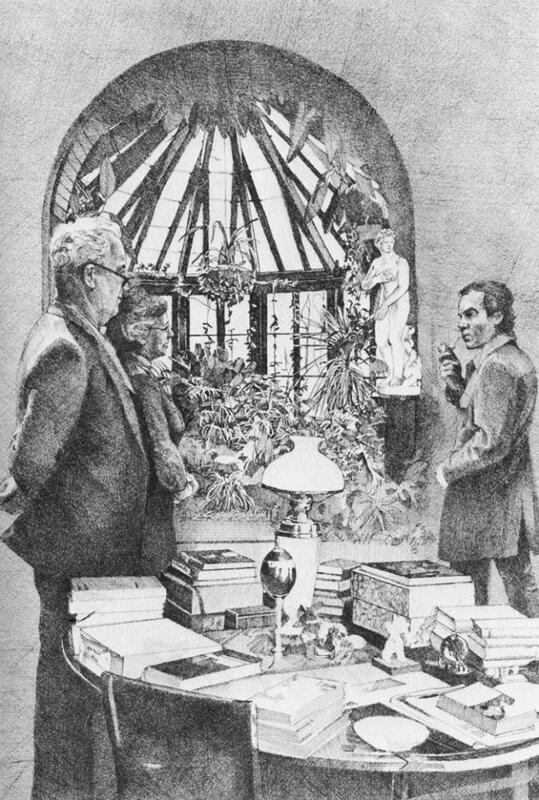 The setting in this illustration is based on the conservatory at Mark Twain’s house in Hartford, CT.